Where: On any tarred road, especially in the vicinity of farms. 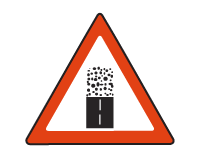 Purpose: To warn that the tarred road you are driving on will end soon and will have a gravel surface ahead. Action: Slow down and look out for ditches or potholes at the joint between the gravel and the tarred surface. Steering will be lighter on the gravel, vehicles will tend to skid easier and will need a longer stopping distance.